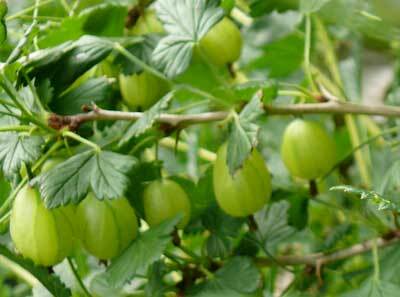 We were pleased to be the first to offer this superb new early/mid-season MILDEW RESISTANT gooseberry. Raised in East Malling Research Station, it produces a very exceptional heavy yield of large, high quality fruit that are highly resistant to Mildew. In trials the yield has been more than double that of the standard variety. Careless, and this new virus free clone makes a vigorous, moderately upright bush that will establish quickly to produce these heavy crops. Suitable for all culinary purposes, the large, white fruits hang in heavy clusters down the length of the branch and are very well presented for easy picking. As would be expected with Whinhams Industry and Keepsake amongst its breeding parents, the flavour is good. Excellent for pies, tarts, jam, bottling etc, and superb for freezing. Heavy crops of mildew resistant gooseberries at last, makes a well shaped bush, or will excel when grown as cordons. Invicta is the first variety of gooseberry to he awarded a Special Stock Certificate of Health by the Ministry of Agriculture. Large fruits, very exceptional yield, established quickly, bearing very heavy crops early in life, good flavour, quality fruits, and highly resistant to Mildew. Highly recommended.